Overview - A former radio DJ, suicidally despondent because of a terrible mistake he made, finds redemption in helping a deranged homeless man who was an unwitting victim of that mistake. Our actions have consequences. It's one of the first things we learn as children. Whether we like it or not, everything we do has an effect on the world and people around us, reverberating outwards in sometimes unexpectedly tragic ways. Even our very words hold potentially devastating power, and it is this phenomenon that sets off Terry Gilliam's 'The Fisher King,' a quirky blend of heartbreaking drama and uplifting comedy that explores the hardships of guilt and the difficulty of healing. Fueled by Gilliam's trademark visual flash and some strong performances from a stellar cast, the movie overcomes some minor flaws to form a memorable and emotionally resonant experience. Jack (Jeff Bridges) is a typical shock-jock radio host, who speaks before he thinks, spewing controversial, heartless rhetoric in an attempt to drive up ratings. When he gives an unstable caller some callous advice, his seemingly harmless words end up having violent consequences. Devastated by the indirect but still catastrophic results of his behavior, Jack disappears from the radio world and retreats into a depressed and listless state. After an attempted suicide goes wrong, the miserable disc jockey is saved by a mentally unstable homeless man, Parry (Robin Williams). Jack decides to help Parry overcome his psychosis in order to win over the girl of his dreams (Amanda Plummer), in hopes of using the good deed as a means of penance for the DJ's own unsavory actions. Unfortunately, Parry may simply be too far gone, and temptations from the shock-jock's former, selfish life attempt to lure the reformed egomaniac into repeating the same mistakes of his past. When we first meet Jack, his face isn't even shown. Instead, Gilliam presents a dizzying display of overhead shots and roaming, obstructed views, showcasing the radio personality right in the thick of his natural habitat, hiding behind his microphone in the heat of a live show. Close-up shots of his lips spouting heartless jab after jab reinforce his almost inhuman, unaccountable behavior, forming a perfect visual introduction to the character. For the first few minutes, through Gilliam's camera, Jack literally is a disembodied voice, a faceless mouth, giving form to the film's thematic undertones, expertly setting up the character's gradual growth later on. Through his friendship with Parry, Jack is given a second chance, and the ultimately symbiotic friendship that forms between the two equally wounded men is the crux of the story. Bridges is fantastic as the formally heartless and materialistic entertainer. His good side is always visible, but the actor brings a certain fragile and precarious quality to his attempted atonement that makes it seem as if he might throw in the towel at any minute. This isn't a simple story of redemption, and as the character learns, true salvation can't be achieved by merely giving kindness a momentary, half-hearted attempt. Complementing Bridges' sarcastic cynicism is Robin Williams, who in Parry finds a perfect vehicle for his manic genius. A kind of homeless Don Quixote or psychotic Lancelot, Parry has retreated from the pain of his tragic life through fantasy, anointing himself as "God's Janitor" in search of the fabled Holy Grail. With just the right balance of high-energy insanity and more somber truth, Williams forms an entertaining and insightful character that plays up the magic of cinema, while still respecting the realities of mental illness. Special note should also be given to Amanda Plummer as Parry's clumsy object of desire. In her own way, Plummer is perhaps the oddest of the whole bunch, and turns awkward, anti-social behavior into an adorable art form. While the film's central relationship and themes are strong, the script does have some minor issues. There are times when characters resort to overly expository dialogue, revealing past events in a rather banal and forced manner. The final act of the film also loses some of the creativity found in the story's earlier segments, with the plot taking some more classically formulaic and predictable turns. This leads to an ending, that while deserved, feels a bit too saccharine. Thankfully, Gilliam's cinematic panache more than makes up for any small flaws in scripting, and the director brings his usual penchant for visual madness to the screen. Distorted, slanted shots and wide angle compositions find a kind of insanity in our everyday world, exaggerating and expanding upon commonplace eccentricity. More overt journeys into the surreal give the film some much needed excitement and tension, including Parry's terrifying visions of an evil "Red Knight," and a beautiful sequence involving an imaginary ballroom that sprouts up right in the middle of a busy train station. 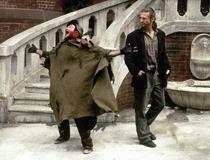 'The Fisher King' is ultimately about two broken men who find a way to heal each other. Just as we are often responsible for causing pain in those around us, we are also capable of easing it, helping each other to reclaim some semblance of what we have lost, through nothing more than simple kindness. Gilliam and his cast create a heartfelt and funny peek into the sometimes insightful insanity that lurks within us all, that feels just as fresh today as it did twenty years ago. Image Entertainment brings 'The Fisher King' to Blu-ray on a BD-50 disc housed in a standard case. After some logos and warnings the disc transitions to a standard menu. The packaging indicates that the release is region A compatible. The movie is provided with a 1080p/AVC MPEG-4 transfer in the 1.85:1 aspect ratio. With an authentic, filmic quality and pleasing detail, the movie looks quite good, showing off Gilliam's occasional bursts of visual madness. The source print is in good shape with a natural, light layer of grain throughout. A few shots are a little soft and flat, but for the most part, clarity is very strong, especially in close-ups, showcasing all of the nuances and intricacies of Williams's dirty, manic face. Colors carry a pleasing but natural vibrancy, and there is some nice pop throughout, particularly during Parry's visions of the Red Knight and a scene set in a Chinese restaurant which features some bold blue and red production design. Black levels are deep and consistent and contrast is strong without blooming. Free of any unnecessary digital manipulation, 'The Fisher King' comes to Blu-ray with a respectful and at times impressive transfer. Gilliam's inventive and energetic camerawork, compositions, and art design shine through nicely, giving the film's sporadic detours into the surreal and fantastical pleasing pop and depth. The audio is presented in an English DTS-HD MA 5.1 track with optional English SDH and Spanish subtitles. While not the liveliest of mixes, the modest but effective design works very well. Speech is crisp with a nice, full quality free of distortion or crackle. Directionality across the front soundstage is strong, with appropriate effects and music cues bustling about. Rear activity can be a little subdued with most scenes limited to minor echoes of score and faint ambiance. The track does come alive during Parry's various hallucinations, however, with creepy voices, booming effects, and even some low end rumble surrounding the listener. Dynamic range is good and balance between all of the audio elements is handled well, though speech can be a little low at times. The sound design doesn't exactly wow with immersion, but the momentary bursts of auditory excitement perfectly complement the film's sporadic peaks in visual creativity, providing a solid and varied listening experience. Terry Gilliam films are often notorious for their troubled production histories and many of the stories behind his works tend to be just as interesting as the movies themselves. Unfortunately, any potential conflicts that may have occurred during the making of 'The Fisher King' will have to remain a mystery, as Image has only included a trailer on this release. Theatrical Trailer (HD, 1 min) - The movie's theatrical trailer is presented in 1080p and LPCM 2.0 sound. 'The Fisher King' is a quirky and heartfelt examination of guilt and healing that is made all the more potent thanks to Terry Gilliam's creative direction. Video and audio quality are both good, presenting an authentic and respectful viewing experience. Unfortunately, there are no real supplements, but based on the strength of the film and technical presentation this disc still gets my recommendation.